There's no matching the taste of a perfectly ripe and creamy avocado, but figuring out when that light green "meat" under the skin is primed for eating can be a little tricky. The anguish of slicing into one that's too hard, when all you want is a little to top your sandwich or toast, is just as bad as realizing the one you bought has already turned brown, splotchy, and slimy inside. Fortunately, there are some handy tips and tricks to remember that'll help you track down the ripest avocados at the supermarket, figure out exactly when they're ready to cut into, and keep those leftovers fresh. One of the better-known ways to check whether that delicious green fruit before you is ready to be devoured is by checking how soft it is, and it is indeed a reliable quick-check method. If the skin is rock hard to the touch, then it's definitely not quite ripe. If it's super mushy, then it's going to be gross and brown inside. An optimally ripe avocado is one that yields to firm, gentle pressure. Some experts say that it should feel about as firm as the skin between your thumb and forefinger when outstretched. While not always a reliable indicator of an avocado's ripeness, it's still worth inspecting the color and texture of the skin to see whether what's inside is ready to eat. 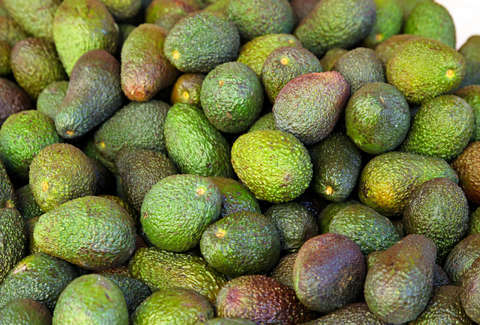 Unripe avocados are generally very green with incredibly taught skin, while the skin on a perfectly ripe one is typically dark green or nearly black, and a bit bumpy. Of course, you're not always going to want to chow down on an avocado you just bought at the store store, so if you're shopping for ones you expect to use in a day or two, go for the ones that are dark green with black spots. Keep those stored at room temperature for 24 to 48 hours and they'll be perfectly ready when you are. This is probably the more reliable way to tell how far along that delicious green orb is in its ripening process. Find the nubby dark stem at the top of the narrower end of the fruit, and pick it off. Underneath, you'll get a peek at what's going on inside under the skin. If what you see is mostly green, the avocado isn't quite ripe, and if you see all brown it's already past ripe. What you want to see is a yellowish/brown color -- that suggests it's perfectly ready for you to slice, dice, and eat. If your avocado is taking its sweet time becoming meal-ready, there are a couple things you can do to speed things up. One trick is to seal it in a paper bag along with another piece of fruit like an apple or banana. This works because avocados and other fruits naturally release a gas known as ethylene, which triggers them to ripen. By trapping the avocado and others in a contained area, it concentrates the gas and should accelerate the process. If you really, really need to make guacamole like right now, another thing you can try is wrapping your avocado in tin foil and placing it in the oven at 200 degrees for about 10 minutes (or longer, depending on how unripe it is). This has essentially the same effect as the brown bag trick, only the heat will speed things up even further. Just remember to cool it in the fridge for a few when you take it out. If you cut into an avocado only to discover it's unripe, here's what to do: sprinkle both inside edges with some lime or lemon juice and place the two halves back together, wrap it tightly in plastic wrap, and check back periodically to see how it's coming along. If you just want to stash away your leftover avocado for later and ensure it stays fresh, all you need to do is sprinkle the meat with some lime or lemon juice and place in an airtight container (or plastic wrap). If you store it this way it should last for about a day in the fridge.